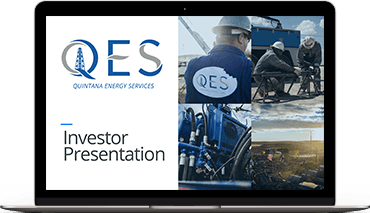 QES (NYSE: QES) is a growth-oriented provider of diversified oilfield services to leading onshore oil and natural gas exploration and production companies operating in both conventional and unconventional plays in all of the active major basins throughout the U.S. QES's primary services include: directional drilling, pressure pumping, pressure control and wireline services. The Company offers a complementary suite of products and services to a broad customer base that is supported by in-house manufacturing, repair and maintenance capabilities. © Copyright 2019 Quintana Energy Services Inc.